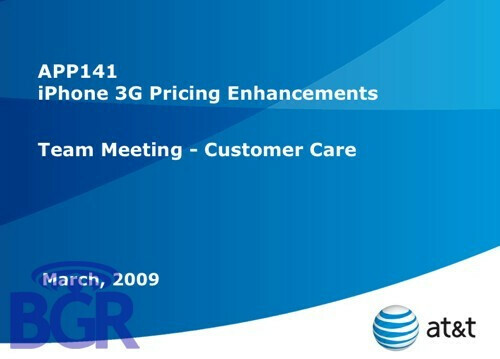 Now here is a fresh offer by AT&T – free iPhone 3Gs! 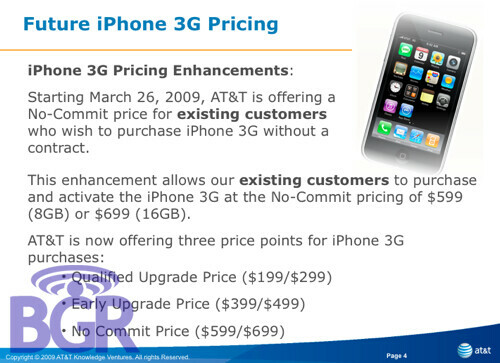 Just kidding, but the truth is that if you are a customer of the carrier, you may soon be able to buy a contract-free iPhone 3G 8GB or 16GB. The 8GB version will be available at the immodest price of $599, and the 16GB one will be yours for $699. 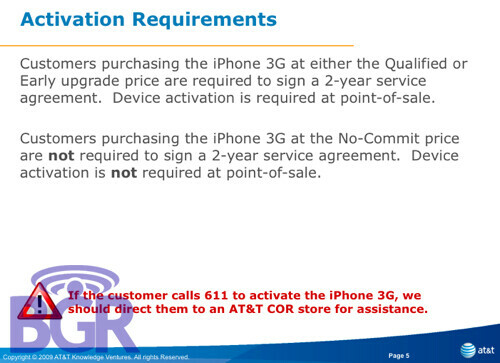 In addition, the newly bought handsets will not require activation, but there’s still the “one-per-line” rule, which means that you will need an active AT&T line in order to purchase one. Fortunately, the source mentions that it is not certain if the carrier has a sure way to track this. Check out the screenshots of the presentation about the new offer below! no phone is worth 699 bucks full price...thats what i think anyway. Can someone please tell me how this makes any sense?? why would you buy a phone for $700 bucks?? 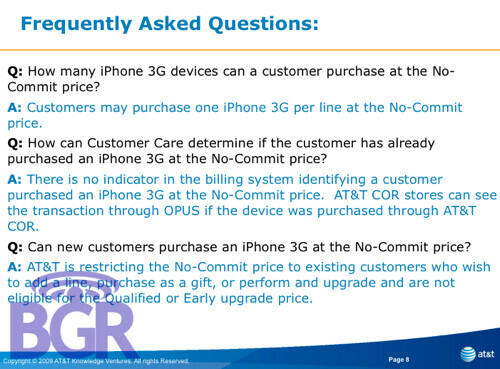 you can just buy the phone with a contract and cancel when you get ready and pay the ETF. Their ETFs are variable (they go down every month you have service) so it would be cheaper to just cancel. Some people don't want a contract that badly. You can buy it and cancel with the ETF but keep in mind you still pay $36 activation fee, the cost of the phone, and the monthly service charges for the time you have it. It would still be less expensive then what they are offering here but it's still pretty expensive considering their lowest plan is $39.99 plus $30 data and of course being billed in advance the first bill is always higher. Other high-end phones are also in this ballpark for price without contrats too. Although this is a little higher other phones aren't too far off of this. Dude, its because not everyone has credit to get a contract...there are ppl out there, believe it or not, who have plenty of cash, but crappy credit. so u pay 6 or 7 hundred dollars for a phone that your not gonna activate? so u have a $700 paper wieght? thats even worse there is no logical explanation for doing this! who says they're not going to activate it? I bought mine new in the box on the craigslist for $400 and the guy unlocked it for me on the spot for $20. I thought you could buy the phone full retail from day one.